Snakes primarily use their venom to debilitate and digest prey. Sure, humans aren’t prey for most venomous snakes, but the toxins work on us in the same way. I mention this because if you keep in mind that venom is intended to secure food, its excessive effects make much more sense. Snakes can deliver a combination of these venoms to capture, debilitate, kill and digest prey. Unfortunately for humans, many snakes are blessed with venom that is far in excess of day-to-day needs. For example, the venom in a single bite of the non-aggressive Inland Taipan has the potency to kill 250,000 mice. Scientists are still unsure why snake venom has evolved to such extremes. There are three families of venomous snake. Each family has a unique venom delivery method, so it’s best to think about the science of venomous bites on a per-family basis. Species: Taipan, Tiger, Cobra, Mamba, Brown, Coral, Sea Snake (Hydrophiidae) and more. Fangs: Hollow (like a hypodermic needle) and fixed (they cannot be folded), but typically short. Due to the short size, the snake will hold on longer to ensure envenomation. Snakes risk injury when they hold on, but the potency of elapid venom ensures the victim is paralyzed quickly. Venom: Predominantly fast-acting neurotoxins, which rapidly cause paralysis of muscles. Effect: Many bites from elapids are painless, which is a worry because the Elapidae family is the most deadly. The fast-acting neurotoxins can paralyze the respiratory system in hours and lead to numbness, nausea, dizziness, and death. Species: Viper, Rattlesnake, Adder, Bushmaster, Copperhead and more. Fangs: Long, hollow and hinged (they extend and fold as the mouth opens and closes). This is the most efficient delivery method because the folding mechanism allows for much longer fangs that penetrate deeper. However, viperid venom isn’t typically as potent as elapid venom but can be just as deadly since it’s injected much deeper with the long fangs. Venom: Hemotoxins and cytotoxins, which attack the blood and destroy tissue. Effect: Most bites are very painful because the cytotoxins destroy tissue immediately. This sometimes requires the amputation of a limb. The hemotoxins, especially in large doses, can be deadly as they cause internal bleeding, excessive blood clotting, and organ failure. Bites may be dry, i.e. without venom. Species: Boomslang, Rat Snake, Vine Snake and about two-thirds of all snake species. Fangs: Rear-grooved, not hollow, which means the venom drips along the grooves into the victim. This is much less efficient as a delivery system, but some colubrids can kill. Venom: All toxins, depending on sub-family. Humans: Most bites aren’t harmful or deadly to humans, though there have been a few fatal cases from Boomslangs. The deadliness of a snake bite depends on where the venom is injected. A snake with less potent venom can be much more deadly than one with more potent venom if it injects the venom directly into your bloodstream (opposed to just your skin or muscles). Anti-venom is created by injecting horses, sheep, goats or rabbits with small (non-lethal) quantities of venom to effect an immune response. Scientists can then harvest the necessary antibodies from the injected animal to produce anti-venom for humans. 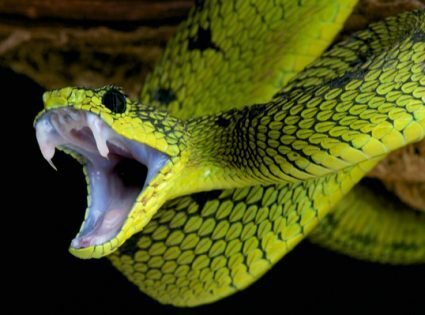 Some anti-venoms are polyvalent, meaning they can act against the venom of many species, but some snake bites require a monovalent, or specialist, anti-venom. Even though Australia has most of the worlds top 10 most venomous snakes, the availability of anti-venom means Australia has one of the lowest death tolls from snake bites.